Rancho Santa Fe Security Systems was founded in 1978 by Myron Mueller with the mission of providing superior security services to the Rancho Santa Fe area and surrounding communities. Over the years, there have been many changes in the security industry, such as the vast improvement in security technology, which Rancho Santa Fe Security systems strives to keep abreast of. At Rancho Santa Fe Security Systems we have maintained a focus on providing superior customer service for our clients. Since 1978 we have added many valuable services for our customers, including our own local monitoring, 24-hour service department, alarm response, long-range radio-frequency back-up monitoring, guard and patrol services. In 1992 Myron’s daughter Denise Korenek, who had been active in the business for many years, took the helm. While maintaining the same customer service focus as her father, Denise has continued the success of Rancho Santa Fe Security Systems. In 1996 Rancho Santa Fe Security Systems purchased its own building in the Encinitas area which allowed for a completely upgraded and state-of-the-art central monitoring station. 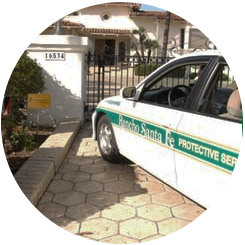 As a result of its successful growth, in 1997 Rancho Santa Fe Security Systems split off its patrol, guard and alarm response division into its own entity, Rancho Santa Fe Protective Services.